For Me? Fine. So Dumb! Home » Film » For Me? Fine. So Dumb! The theory holds that monkeys typing on a typewriter can eventually produce “Hamlet” by accident. Presumably, Jack the Giant Slayer is one of the monkeys’ lesser works. Hobbled together by five writers, one of whom is a previous Best Screenplay Oscar winner, this film is a series of studio executive notes stretched into two hours. Unimaginative, uninspired, undeserving of attention, this bloated monstrosity sleepwalks through blockbuster formulas before limply falling to earth like a flaccid beanstalk. You know that Nasonex commercial? The one with the Antonio Banderas bee? That has better computer animation than the first five minutes of this major motion picture. This is not an exaggeration. It’s as if they originally had designs of doing something stylish and interesting but everybody forget about it until an hour before it was due, so Larry in I.T. crapped out something quick. Nevermind the blandness of the backstory that opening sequence details, the lack of quality was an instant “eff you” to the entire audience who had at least expected special effects of some value. There are weekend weather reports on local news with higher artistry. Then comes the movie itself, which five people will remember: Jack (Nicholas Hoult) winds up with magic beans that get wet and create a bridge to the land of the giants that hover over his kingdom. The princess (Eleanor Tomlinson), who had wandered off the kingly reservation, winds up accidentally aboard the beanstalk express to giant-ville. So the king (Ian McShane) sends his best man, Elmont (Ewan McGregor), and his secretly evil advisor, Roderick (Stanley Tucci), to retrieve her. And something about a magic crown that makes giants do your bidding and the giants all look like computer generated police sketches. This is a movie where there is a character named Elmont, which really tells you all you need to know. Director Bryan Singer clearly wanted to hit eject halfway through this drunken impression of a Peter Jackson movie. You can tell because immediately upon completion, he agreed to direct the next installment of the X-Men franchise, which he had previously spurned when he was bigger in his britches. Nobody’s career will get out alive here, except for maybe the charismatic and young Hoult and McGregor’s exceptional hair. Jack wears a hoodie; he wears a medieval, leather hoodie for most of the film. You have enough time to ponder the life of a hipster from the Middle Ages while the film ever-so-slowly bumbles its way towards a thoroughly unsatisfying fart of a conclusion. Even the effects, which are usually the saving grace of such a high-budget clod, are stupefyingly bad. Who designed these mythical giants to look like ugly rednecks? 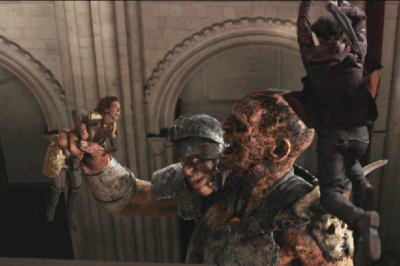 There is nothing good about Jack the Giant Slayer. From a title that tries too hard to a director who gave up to a script that has a frickin’ Elmont in it. This should be put into a time capsule so that future generations will see the precise moment when the fantasy epic belched its death rattle. Someone Amour this genre with a pillow, please.